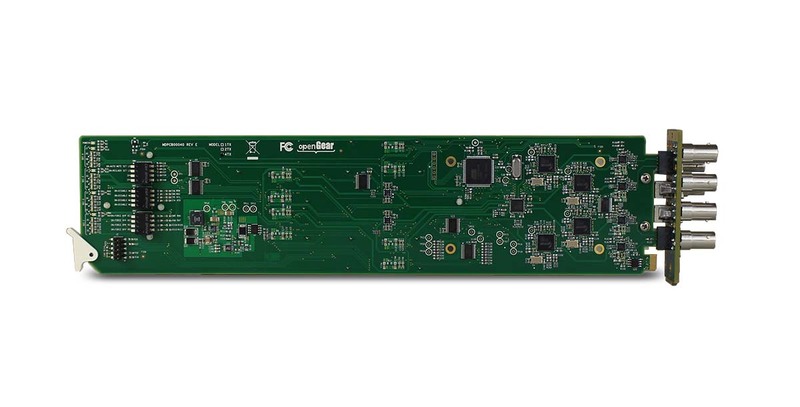 The HD-4000 series of modules for the openGear platform provides flexibility in how you handle your SDI signal transport. Capable of handling SDI rates from 5 Mb/sec all the way up to 3 Gb/sec uncompressed, these cards will automatically detect the incoming signal and give you full control over re-clocking and routing. Five different cardsets available in the HD-4000 line.With each module you get the same control features that are available both on the front card edge (via dip switches) or through the openGear DashBoard software. But the true power of the 4000-Series is the ability to daisy chain up to five cards to create an 18-Channel CWDM, single fiber, mux that is ideal for high-density signal trunking. The HD-4000’s also incorporate an integrated cross-point matrix that allows not only the ability to assign a given input signal to one or more outputs, but also to enable and disable outputs should the need arise. There’s also an automatic fail-over mode that, when selected, will switch to another input should the signal in the first input somehow fail. Embeded audio is fully supported. All outputs are non-inverting and ASI capable. The HD-4000 is the cost effective way to move all of your HD signals along with the convenience of a built-in switcher, remote monitoring and automatic fail-over protection switching. Designed and manufactured in New York.